Give this man an Oscar already before he puts his life on the line even further. 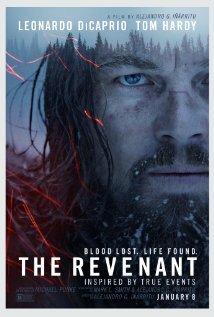 The things Leonardo Dicaprio had to do as Hugh Glass to survive in this adventure was truly challenging. Leonardo did extremely well acting in this role. Not only does he do over the top stunts in sheer cold weather but he does an amazing job bringing this character to life as well. Aside from Leo's great acting, John Fitzgerald (played by Tom Hardy) made you really hate him and was the antagonist you didn't want having a happy end. There were other actors who did phenomenal, but those two stood out the most. Without any spoilers, the trailers show you the gist of what the story is about: John kills Hugh's son and Hugh is out for vengeance. The only thing is, he can't do anything about it because he's left for dead with his body practically torn to shreds from a bear attack. He slowly heals and with the help of a certain Native American along the way, Hugh recovers just to an extent to get revenge. The Revenant is based in the 1800s during a fur expedition gone wrong after a Native American raid to steal fur and kill the trappers. Soon, it becomes a race for survival back to the outpost. The Revenant was a good movie in most areas. I loved the acting first and foremost and I enjoyed the shooting throughout — the bear scene was gruesome and everything else that Hugh Glass had to do to survive was just amazing too.